Another nice glove from the seller of the OK glove above. A Denkert "Mickey Mantle" glove and box sold for $787. 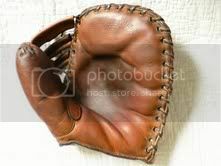 Glove looks to be in unused condition. One thing I like about the Denkert made glove and the various retail brands they supplied is the classic Mantle endorsement across the whole face of the glove. This one is right up there if not the best. I had my eye on the Joe DiMaggio OK Model Stubby Finger glove and watched it like a hawk from the day it was posted on eBay. I was in the running to win the glove for a little while, but I stopped bidding at around $550. Congratulations to the winner. Maybe one day I'll get a chance to meet the owner and trade him/her for it, or maybe even own a Joe DiMaggio OK Stubby Finger in amazing condition just like this one. Last edited by ambrizt on June 1st, 2013, 12:19 am, edited 1 time in total. The DiMaggio OK model isn't too rare - there are some out there so if you really want one, keep looking, as they do pop up from time to time. Just wont be in the same condition the one that sold was in. My one problem with this model is that its such a high quality, well made model but they used plastic binding. It's very out of the norm for an OK glove. If it was in production at the end of WW2, that could explain the justification for using a lesser material but I have no proof to back that claim up. I was the bridesmaid, not the bride on that one. Bummer. I wonder who won it. A "Walter Johnson" model from Legendary sold for $478. May be a National Brand. Glove's in great shape. An interesting Alex Taylor Brand glove sold for $108 on ebay. Probably made by Rawlings. Identical to the "Paul Waner Special" model circa 1930. A striking two tone Reach base mitt sold for $113. I kind of regret not bidding on this one. It's the "Hold Fast" model and probably their top mitt 1915-20's. Unfortunately missing the whole sewn on buckle web attachment which kind of sucked. To Brett: That's good to know about the availability of Joe DiMaggio OK Model Stubby Finger gloves. I own one that I bought from JD's site (ebbets55) abut a year ago, and I'm very happy with it. It's not quite in the same condition as the DiMaggio OK Model that was sold on eBay just a few days ago, but like I said, I'm happy with it. But of course, it sure would be nice to own one in near mint/mint condition... Maybe one day. What do you guys think? I was a little hesitant to buy it at first because of the ink on the wrist strap (the "AW") but I figured that at some point I might learn how to remove the ink safely. In the meantime, I love the look and feel of the glove. The AW looks even smaller in person and doesn't take away from the appearance of the glove. Really, it looks fine. Hi Tony, Saw your question a while back and thought you deserved an answer. This nice old glove is as good a place as any to launch a collection. I noticed a few things that might be helpful as you go forward. First, many collectors look at the lining and binding, or piping of these old ones. Your glove has a partial lining and a fairly thin binding. That just means it's not a high end glove. Instead, it probably one that sold hundreds because it was inexpensive in comparison to the top models. One suggestion I would have is to try to get yourself a copy of the Catalog Source Book, published by The Glove Collector, Joe Phillips. This book will key you in to the wide array of gloves that have been manufactured over time and help bring you collecting into focus. Thanks for the tip! I'll definitely look into the book you mentioned.